"I feel that in any walk of life that everybody has to be creative with whatever it is, whether you’re working on a car or your painting, whatever it is." There is nothing better than the start of Spring and looking forward to some great Rock shows in the Summer. 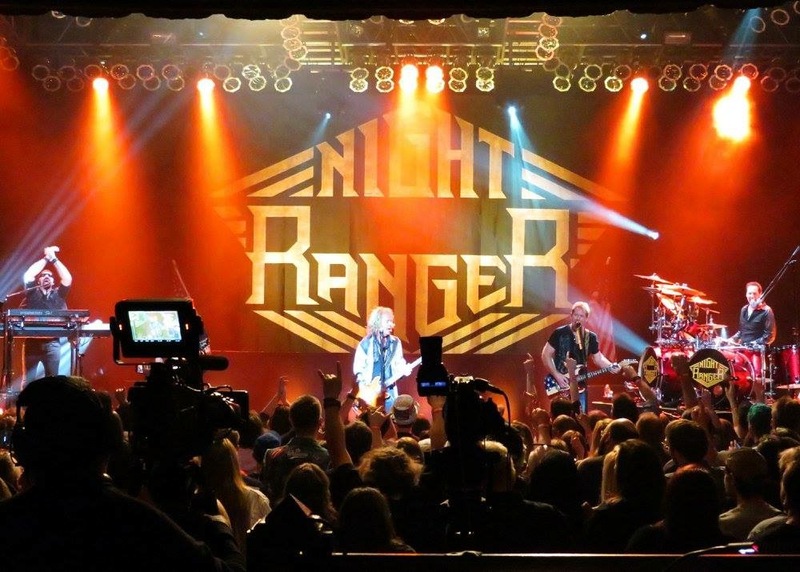 No band epitomizes the good times of summer like NIGHT RANGER. For 35 Years, they’ve shared their Bay Area California fun in the sun sound with the world, and with no letup in sight they prepare to release their 12th studio album, appropriately titled Don’t Let Up, March 24th on Frontiers Records. 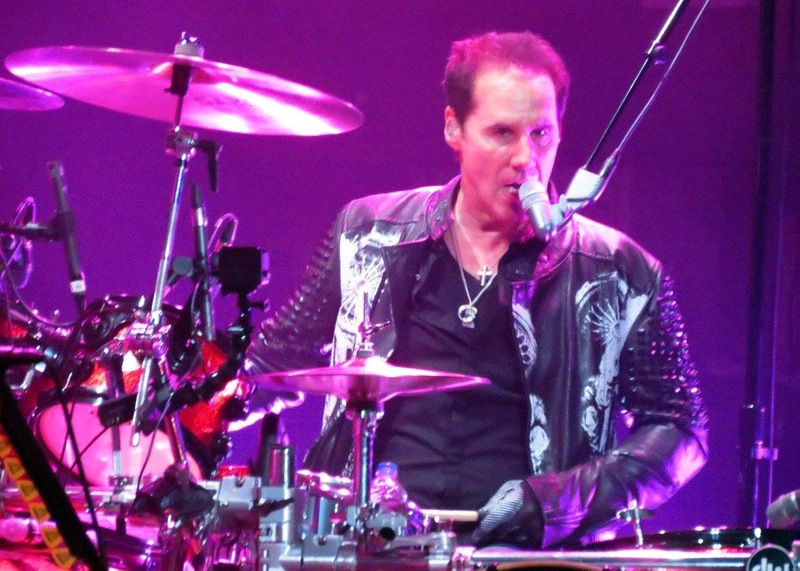 I recently caught up with founding member drummer/lead vocalist Kelly Keagy to discuss the new album and all things NIGHT RANGER. KNAC.COM: You guys are celebrating 35 years and that’s how long I’ve been a fan and to be able to be sitting here talking with you about some new music is about as good as it gets for me personally. KEAGY: Oh, thanks I really appreciate it. KNAC.COM: I know that you guys are really excited about the new album and there’s really nobody that’s been busier with the release in December of last year of the live album 35 Years & A Night In Chicago, and now the new album which I think is appropriately titled Don’t Let Up because there clearly is no letup in NIGHT RANGER. KEAGY: You know when we came up with that title we thought that it was just so appropriate and so fitting because you know you get ten, fifteen or twenty years behind you and everyone thinks you’re a has been. But we always look at it like let’s keep rolling with this and see if we can push ourselves, and push our own envelopes a little bit to come up with better stuff and just keep being creative and keep that desire going. KNAC.COM: So how did this all come together because I know that you guys are all scattered around the country now living in different places. What was the process of putting this album together? KEAGY: Well this was something that was a big experiment for us recording-wise because the last three or four albums we would do some recording in our own studios but there was always one place where we would go and all be in a room together. But what we did, and the best part of it came out during the writing sessions, so once we got the songs started and with the ability to record the stuff on computers with pro tools and stuff like that, we would just share hard drives or just share sessions even and send them over the internet. So, once we got the songs written that was the most important part was for us to all be in a room together to write the songs. So basically Jack (Blades) and I and Brad (Gillis) got in a room, we had a couple of sessions here in Tennessee, Brad’s got his studio in the Bay Area so we set kind of like a template of these are the songs, these are the arrangements, this is how the songs are gonna go. And once we did that then everyone could take their tools at home and use them and record their parts. And most of the time the parts weren’t any different than what we did as the demos. I guess a long story is the experiment was that we weren’t recording everything in one room together, we were in separate locations for this one but everyone knew what the parts were going to be so it was OK, but it was kind of weird not being in the room together. But since we had written the songs together in one room that made up for it. KNAC.COM: Well I had seen where you all were in Nashville and then you took a break to do the live album and then went back to work on it. 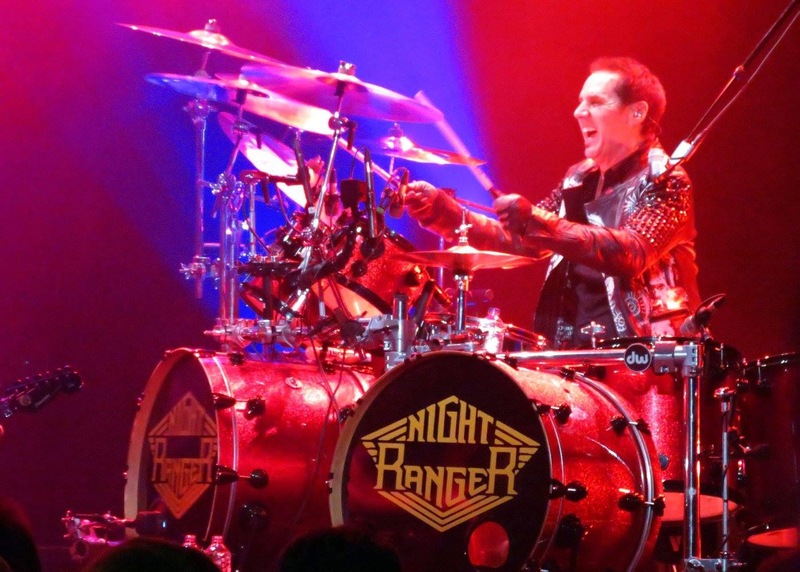 What’s always amazed me about NIGHT RANGER is that every album has its own unique vibe but you guys stay true to that classic and unique NIGHT RANGER sound and you keep it fresh. 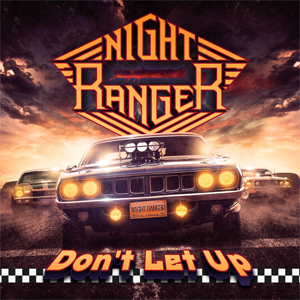 Can you talk about some of the inspiration behind Don’t Let Up and how you guys channel that inspiration into a true NIGHT RANGER album? KEAGY: Well I think that we always start with musical ideas, the three of us. On the last three albums and this record we’ve gone into the studio with no pre-written songs and we would just get in there and start to jam musical ideas and we’ll start to pick up on those inspirations. And whatever we’re jamming on we’ll be like “Oh this sounds like it could be a really cool verse” or “Maybe this is a great intro”. So, we would just kind of follow that little kernel, like a little seed or a kernel and you just start to expand on it and with us playing together for so long, it’s like instincts we just pick up on each other’s vibe or if somebody will make a mistake, and sometimes that works and so we’ll just follow it, just tap into it and follow it. KNAC.COM: You gave everybody a little taste of the new album by including “Day & Night” on the live album and that’s a great track that features you on vocals. Do you have a favorite track on the album that you’re really looking forward to playing live? KEAGY: I think what’s exciting about this record is that the record company likes so many songs and I’m with them on that. They like “Truth”, “Day & Night”, “Don’t Let Up”, about three fourths of the record they want to release as singles and I’m like “Yeah Man…it’s about time”. They’ve always liked our records, Frontiers has always been a big fan of ours but to have so many songs be something that they want to be a part of, I think that’s really a plus man to have the record company liking everything that we’re doing. KNAC.COM: I can’t wait to see some of this stuff live, because I see a lot of your shows every year and with the catalog that you have, putting together a set probably gets more complicated because obviously with the new album you’ll want to work that into the live set and of course stay true to the hits, but do think you guys will ever go back to maybe pulling out a few deeper tracks from some of the classic albums because everyone wants to hear “Sister Christian” and “You Can Still Rock In America” and of course you’ll always play those but songs like “Passion Play”, “Halfway To The Sun”, “Faces” and “Why Does Love Have To Change”, I’m just requesting here..
KEAGY: (Laughs) No, No these are all songs that come up, I’m surprised that you said “Faces”, that’s really funny, that was just on that one tour and we never played it again, but “Why Does Love Have To Change”, same thing man, we had it on a list and before every tour we throw songs on a list and “Passion Play”, “Why Does Love Have To Change” and the ballad that was on the first album…”Call My Name”. We pulled those out and played them for the Japanese audience but whenever we come back over here to America and start a tour those songs always seem to like fall off the list and I’m with you, I want to keep those songs on there. Ya know we started throwing “Penny” on there but that’s not like “Passion Play”, ya know I always thought “Passion Play” was so cool back in the day because that was like one of those things where we expanded on the scene and we just used it to create some sort of atmospheric imaging on it, and it just became a song we played. KNAC.COM: Well maybe here and now with us talking we’ll get it on the set list this year. KEAGY: I’m telling ya man, it’s like every once in a while, we start playing it, like Brad will start doing the intro and I’ll start playing it and then we only get halfway thru and that’s during sound check and then we’re like “we gotta finish sound check” so we stop (Laughs). KNAC.COM: You know with a 35-year career and a dozen studio albums and I posed this question to Brad when we did the interview for the release of High Road and I didn’t get a “Yes” but I didn’t get a “No” either so I’ll ask you. You guys have to have some unreleased material with maybe some alternate versions of songs and demos hanging around, has there been any discussions about maybe releasing a box set of your material? KEAGY: (Laughs) Well you know before Jack had moved from his ranch up in Sonoma County where we were doing a lot of these records, we found our first demos on a 1” 8-Track tape and some of the songs from the first album, different versions were on that and the tape is so old, you have to bake them in an oven to make them playable but I thought it would be so great to remix those songs and throw them on to the end of one of these records or just put them out. It was kind of horrifying because some of the versions were just gutwrenchably horrible (Laughs). But it might be fun to have 'here’s this demo and here’s where it went with the final version'. KNAC.COM: With both you and Jack being such great singers is it hard for you guys to decide who’s going to lay the vocals on a track and how is that decided? Do you just sing the songs that you write or do you maybe record different versions, one with Jack on vocals and one with you on vocals and see which one you like better, how do you determine that? KEAGY: I think what we’ve been doing lately is we’ve been splitting songs, where I sing a part or a bridge or something like that. Every album I either sing more or sing less and all that is, is while we’re doing the song, we’re writing the song and we’re making a demo out of it, that’s when you really realize who wants to sing it. All it is is“you going in there and sing” or “you sing the verse and I’ll sing the chorus” and then we’ll sing the chorus together. It’s all about the creative process from the get go, all the way from writing the song until we record it. It’s all about what sounds great, what we all agree on sounds great. We never argue about it because we’re each other’s biggest fans. It was so great having Brad come to my house here in Tennessee, he didn’t really bring anything. Our gear is stored here but we were just doing demos so we just used whatever was available with instruments and I handed him this old Strat, it wasn’t even an old Strat it was just like a regular Strat that you could buy from Guitar Center and he loved it so much that he used it on the parts on about four of the songs. It was so cool because it wasn’t like his red Strat that he uses on every album, it was like thick, it was a normal Strat and he goes “This thing sounds great”. It was a Strat that Jim Peterik gave me. He’s an amazing song writer from Chicago, I’ve written songs with him, Jack’s written songs with, he was in SURVIVOR and he’s wrote a bunch of hits with .38 SPECIAL, and we traded one time and I brought a snare drum up to a session and I gave it him and he goes “Here take this back home” and he gave me this Strat and he signed the back of it and it was so cool. So that was the Strat I handed Brad to do the first songs “Day & Night”, “Running Out Of Time”, “Jamie” and one other song so it was really neat to have him inspired by the sound of that thing and we used it. KNAC.COM: Yeah, I don’t want to leave Brad out, and Keri (Kelli) either as this is his first studio album with the band. As always there’s some amazing guitar work and some great dual leads and double harmonies on Don’t Let Up. Did you just lock these guys in a room and let them go because they really pulled off some good stuff on this album? KEAGY: Absolutely that’s the way to do it, once they have a good song to play to then you just unleash 'em and let 'em go. And that’s what they did, they went up to Brad’s house up in the Bay Area and they went up there like three times to work on the solo stuff, so that’s the best way, just leave 'em alone. And then whatever they come up with they ask our opinions and then they might go back and retweak but I don’t think you can ever go wrong with letting them do what they want to do because they’re some of the best musicians in the world. 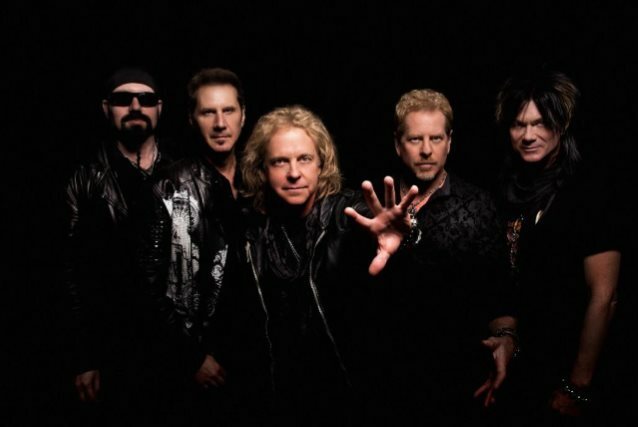 KNAC.COM: A lot of bands with your longevity just tour on their past and don’t release new albums, but that’s never been NIGHT RANGER, which is one of the things that I appreciate so much about this band is that you keep creating and playing your new music while remaining true to your past. How important do you think it is for bands to keep releasing albums today with the recording industry being what it is with everyone wanting to download a song here or there? KEAGY: I think if they have it in them they should, they owe it to themselves I think to be creative, to keep that seed growing, you gotta keep it going because if it’s left dormant it’ll just sit there. I think fans want to hear it too, they want to hear new material even if it’s two songs. For us it’s a pivotal point in the set to us because we couldn’t just go out and play old stuff. We did that, we didn’t make records for probably eight years when we got back together in the middle 90s because it was fresh again for us and we thought OK who’s gonna want to hear new material? But after a while we started realizing that all of the touring we did in that eight years people started going “when are you guys going to make a new record”? And we started hearing that more and more and once we started that up we couldn’t let go because we realized it was rejuvenating our lives and it was what made us tick as a band and also as individuals. I feel that in any walk of life that everybody has to be creative with whatever it is whether you’re working on a car or your painting, whatever it is, it doesn’t have to be in the arts. It just has to be where your brain is being creative where you’re making something from nothing or you’re enjoying making something, it’s all about that. I think once you start that up…going back to the band, it’s a very important part of our DNA. KNAC.COM: I know that you’ve got quite a full card with NIGHT RANGER and all of you guys have released a couple of solo albums and I really enjoyed your last one, I’m Alive. Is this something that you might like to get back to when things calm down with NIGHT RANGER? KEAGY: Sure, just last week I had Bruce Gaitsch, one of my oldest friends here in Tennessee, he’s from L.A. and we did an album together in 1989, that was the first time I met him and we started writing together and in the past three or four years we started stock piling songs along with another writer friend of mine I mentioned Jim Peterik to you. And he came over and I started playing him a bunch of songs and I’m like “here’s some of our songs from the last five years” and he’s like “You’ve got ten songs, you’ve got an album”. And I hadn’t thought about all the songs we’d written together and I had no idea that I had that many songs and so I’m like maybe I’m going to start entertaining the idea of putting another record out maybe next year. KNAC.COM: You guys are on your 35-year anniversary and a lot of bands have been going back and playing their classic albums in their entirety. Is that something that you guys have ever thought about or talked about doing? KEAGY: Absolutely! Absolutely! I know that a lot of people have been doing that and we didn’t want to do that this year, we just wanted to concentrate on the new material but yeah we thought about doing the first two records (Dawn Patrol and Midnight Madness) which might be really fun to do because there’s a bunch of songs that we don’t play on the first album and there’s a couple on the second album that we don’t play, that would be awesome and we thought about that and we’re gonna do that, I’m not sure when (Laughs). KNAC.COM: Kelly I appreciate your time, it’s been a pleasure talking to you. The new album is coming out and I’m thrilled for it and can’t wait to get out and see you guys live. I want to wish you all the success in the world with the album, and I think everyone is going to love it because it’s classic NIGHT RANGER but it sounds brand new, I’ve been playing it and I can’t get it out of my head. KEAGY: I love it, I love it, that’s really great, that’s nice to hear man and we’d love to see you, any date you want to come to just let us know and we’d love to have you.